Are You Worried About Outsourced Accounting Services’ Cloud Data Storage? One of the concerns that accounting firms always have when they consider outsourced accounting services is whether or not handling all of their clients’ data via cloud computing is a safe practice. The truth of the matter is that cloud data storage is in fact safer than most systems found within the average firm’s office (assuming their computers are online). Here are 4 quick points you should consider when you’re worried about using the cloud to handle your data. 1. 86% of companies worldwide are using cloud storage. It makes a lot of financial sense for companies to use cloud storage. It’s unlimited storage for a minimal price, as opposed to buying storage servers and maintaining them themselves. International business concerns like PricewaterhouseCoopers, SunGard Financial Systems, General Mills, Coca Cola, HTC, and so on all rely on cloud services offered by equally mega-sized companies like Amazon, Google, and IBM. These businesses obviously have a lot to lose if their data is hacked. But they trust that data to the cloud knowing that the big-business cloud providers also have a lot to lose if their security features are compromised. 2. Your outsourced accounting services enjoy the same level of security as that used by big firms at no extra cost. 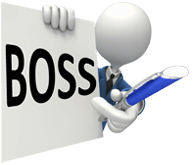 When you partner with BOSS there is no additional cost to utilise our secured servers. Even if you’re a one-man or woman shop you’re utilising the exact same level of security that is enjoyed by the biggest firms that BOSS does business with. Astonishingly complex algorithms are used to scramble (encrypt) your information when you send it. Another algorithm is used to unscramble the info at the far end. Hacking info encrypted in this manner is not literally impossible, but as close as one can get. It would take a hacker an immense amount of computing power, top-of-the-line forensic software, and a lot of time (potentially years) to crack such a system. To create that level of security in-house you’re looking at tens (if not hundreds) of thousands of dollars in computer equipment (that will constantly have to be upgraded) and personnel who will constantly have to be training to keep up with security demands. 3. You personally are much more likely to be hacked than cloud storage systems. The way the bad guys usually get into a system that they’re not supposed to have access to isn’t through the system itself. Instead what they do is “hack” people who have access to that system, including those used for outsourced accounting services. There are three main ways that this can happen. The first is that your password is very easy to guess. Hackers can get a surprising amount of information about users, so you should assume that they can get the names of your children, your anniversary date, your father’s middle name, and so on. They just plug all of these too-easy passwords into a program that enters them into the outsourced accounting services’ entry portal until one of them works. The counter to this is of course is to use a proper password made up of random numbers and letters and symbols that have no personal meaning. The second way that hackers can get access is known as a “social engineering” hack. In this case a hacker tricks you into telling them your password. They might call up and say that they’re an I.T. person and they’re having problems with the system so they’ll need your password to clear things up. Or they may send you an official-looking email asking you to enter your password for some kind of confirmation. The third way you may be hacked is if you use the same password on more than one computer application. This is a big no-no. Your outsourced accounting services cloud password should be different from your bank’s website’s login password, which should be different from your email password, and so on. This way if they manage somehow to get one password, at least they won’t be opening the doors to all of your sensitive information. 4. But wasn’t Apple’s iCloud hacked? Apple’s iCloud getting hacked was big enough news to enter the public consciousness. There’s just one problem with all of those media stories that made you worried – the iCloud wasn’t hacked at all. Instead what happened was something like what happened in point #3 above – hackers didn’t hack into the cloud itself, instead they were able to get at the passwords of certain celebrities and use those to enter the cloud’s stored data. But the cloud itself? It was never cracked. Outsourced accounting services – secure, quick, and easy. No, there is no such thing as 100% security online. But unless you intend to bury your clients’ info in an underground bunker somewhere you’re probably not going to be able to create as secure a system as that on offer from us here at BOSS.